I was calmly working on adapting a template to fit my needs…ok, that’s not quite the truth. It would be more accurate to say that I was muttering, hollering and whacking myself on the head, desperately hoping that my brain would suddenly click and css and php would sense to me. Shaun, the man who says he loves me, would just casually wander by, laughing his fool head off at me. Either way, I knew I had to stop struggling with the blog page if I didn’t want to turn myself into a widow. (See, I told you it was all his fault!) I decided it was time to try a different tactic. I always tell my children that you always catch more flies with honey than with vinegar. So…I did the one thing that he’s always asking me to do. I made him a pie. 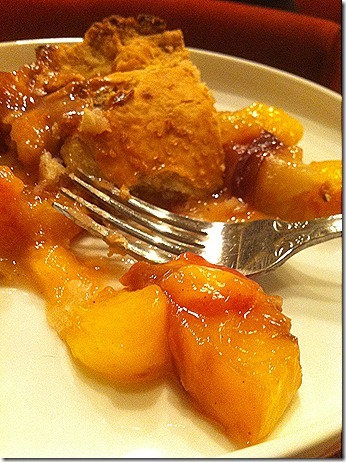 It was a beautiful pie made with fresh peaches that I picked out for him myself. As I lovingly rolled out the pie crust and gently placed it in the tin, I thought of how happy my Beloved would be. I just knew that he would be so overwhelmed with joy that he would fix my blog up for me in a jiffy. Apparently I was a little overly optimistic. The pie is gone…yet my blog site is still a mess. This entry was posted in Food, Humor, It's all about me!, Love and Marriage, Technology, That Man O' Mine and tagged blog, computer programing, css, peach pie, php. Bookmark the permalink. Mmmmmm, pie. I love pie. what! Pie and no blog help?? You could always try and look up pre-done coding for your site. There are plenty of sites out there with layouts and designs to use. Then its just tweaking those a little to get it the way you want it. Just look up “WordPress blog themes” “wordpress themes” ect! Hope that helps. I like the old one with the lemon slices… but then I don’t adapt to change very well anymore. I haven’t made a pie for awhile. Maybe I should do that. Peach sounds yummy. Susie, been a while since I last came in, but I’m going to be better about it from now on…until next summer when life gets super crazy again. lol. Loved that you tried to bribe your hubby with pie. I’d fix it for pie. *smiles* No, really though. I agree with the commenter above, wordpress has some very user friendly themes that you can customize to your hearts content. I just ‘revamped’ my own site. lol. Not sure it’s wonderful, but I’m pretty happy with it. Best of luck getting hubby to help. Oh that pie looks yummy.. but the changes have to come before the next one this time. Come on, Shaun! I never use readers. I enjoy looking at “the real thing.” If you do figure out php and css, let me know. I could use the knowledge on our church website. I laughed at this post. I was smiling until I got to the end, somewhat disappointed the plan didn’t work. This is totally something that I would think of to get my hubby to do something, NOW. haha yeah, at least i have pie. Better luck next time, you just need some slight alterations to your plan!